Dutch Anonymous?, after 1630. 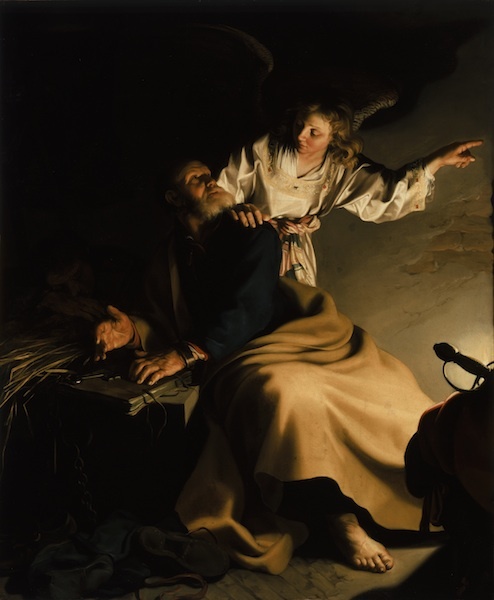 The Liberation of Saint Peter. Oil on Canvas - 145 x 119 cm. Photo : Cincinnati Art Museum. Image Source: The Art Tribune. A beautiful exhibition of Caravaggio's paintings, along with contemporary paintings in related styles, and painters who imitated Caravaggio's dramatic late 16th and early 17th century chiaroscuro style, is traveling in France and the USA this autumn and through next year. The exhibition is showing in France in Montpellier, Musée Fabre and Toulouse, Musée des Augustins, from 23 June to 14 October 2012. The exhibition will then travel to the Los Angeles County Museum of Art from 11 November 2012 to 10 February 2013 and to the Wadsworth Atheneum Museum of Art in Hartford, Connecticut from 8 March to 16 June 2013. 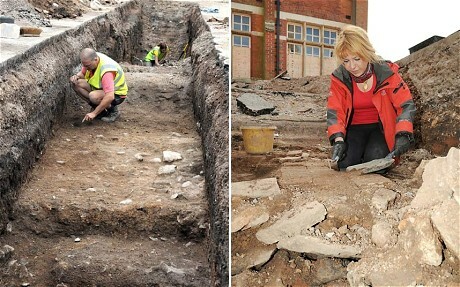 "Archaeologists searching under the city centre car park for the lost grave of King Richard III have discovered human remains." Image Source: Telegraph. The Telegraph and other news outlets are reporting that archaeologists may have discovered the body of King Richard III in Leicester. Already the find promises to rewrite history, and also diverging from Shakespeare's picture of the notorious monarch. 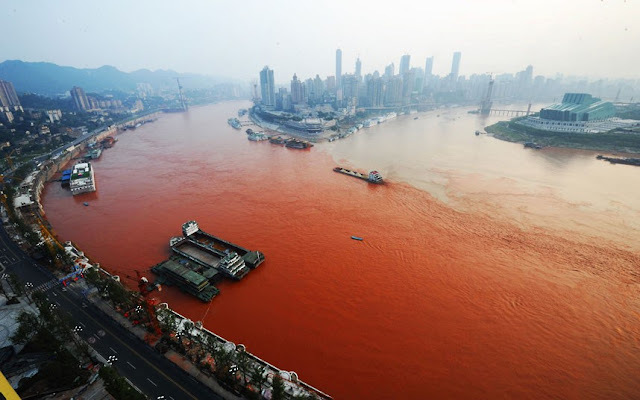 The Yangtze River has turned bright red, likely due to silt deposits from floods upstream or industrial pollution. Images Source: The Telegraph. Other reports: here, here and here. 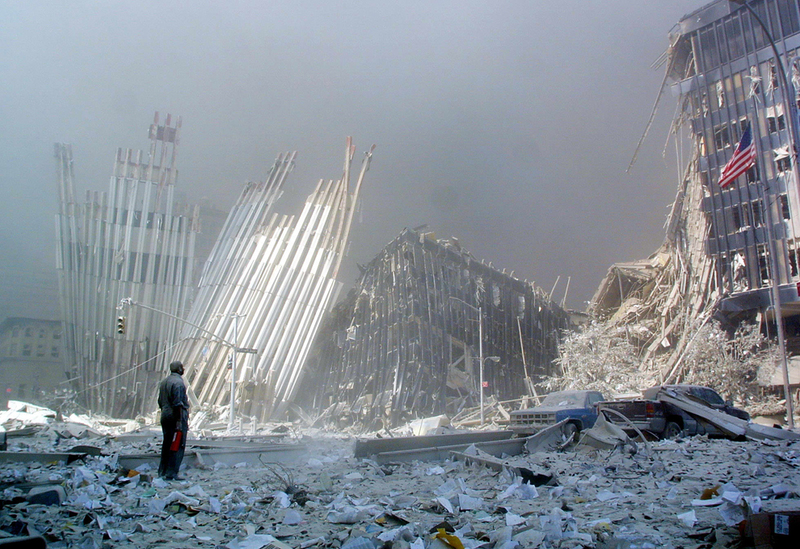 See my earlier posts on 9/11: here and as a general topic, here. I once found myself in library, working against the clock, with a body of archival material that had to be returned. The material was a set of microfilmed diaries. One man's whole life was on these films. He had been a compulsive diarist, and there were some 32 films in all. I had about forty-five minutes to find the core of his private writings. That is not an ideal archival research situation; but it sometimes happens. Aside from what I read that was relevant to my research, I found that he had, from age five up to his death in his early eighties, repeated certain patterns in how he addressed himself. For instance, he made lists of people, events and possessions throughout his life. He also played tic-tac-toe, or noughts and crosses, in the margins of his diaries, apparently absent-mindedly when he was thinking, from about age eight onward. While I immediately recognized these patterns because I had a brief time to understand this person, it seemed clear that he had engaged in these habits unconsciously or semi-consciously. This is a reverse phenomenon from déjà vu, the false sense that you have seen or done something before. (Incidentally, Czech scientists have recently found that déjà vu is caused by a malfunction in the cerebral cortex.) This is something that one actually does repeatedly throughout life, but one rarely recognizes it. 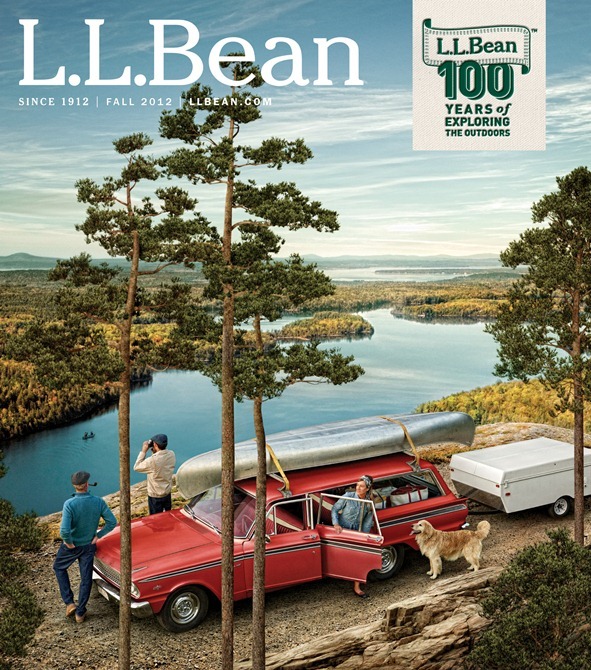 L. L. Bean's 100th anniversary Fall 2012 catalogue. The cover redoes their 1966 catalogue cover (below). Image Source: Boston Herald. Old School has gone back to school. I noticed the Hudson's Bay Co. is selling Liberty blouses and L.L. Bean's latest catalogue reads like a homage to the preppy look in 1982. Truth to tell, these stores might never have left the early 1980s (or the early 1960s, or the late 1940s, or the mid-1920s), but the current fad extends beyond their niche markets. In fact, preppy looks made a resurgence around 2007, and have popped up sporadically since then, especially in 2010. Such is the preppy buzz on the blogosphere that Take Ivy, the 1965 study of the look by Japanese photographer Teruyoshi Hayashida, is being re-issued by Power House books this month. The book is part-fashion guide, part-photo essay and features shots taken at America’s prestigious Ivy League universities, presenting an anatomy of preppy style. The redux has raised hackles, with some purists insisting on the difference between, "clownish Preppy and authentic Trad." And Gen Y has conflated a preppy tradition with hipsterism. L.L. Bean catalogue, Spring 1966. Image Source: Boston Herald. The Fall 2012 L.L. 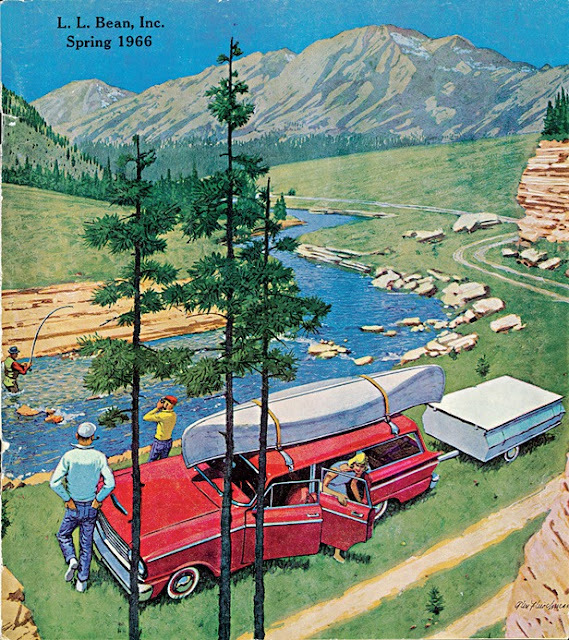 Bean catalogue reproduced its 1966 Spring catalogue cover. 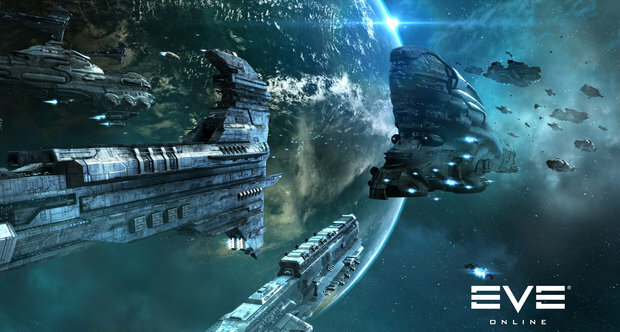 The 2012 catalogue also repeatedly refers the last time L.L. Bean was the height of fashion, when it was mentioned in The Official Preppy Handbook (1980). The latter was an American comedic manual of manners and fashion, shortly followed by Britain's Official Sloane Ranger Handbook (1982). You can see both deconstructed here.